Phormium Tenax or New Zealand Flax is a group of striking architectural plants indigenous to New Zealand that grow to about 2m high in most conditions. Centuries of developing and evolving in a geographically isolated environment has meant that Phormiums have a truly original shape that offers year round interest. Out of a bed of jutting upright strap-like spiky leaves (dark green above and blue-green below) protrudes a tall flower stalk upon which smaller stalks give way to splendid dark red flowers, a striking feature of phormiums. 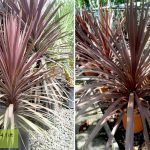 Phormium Tenax requires virtually no maintenance apart from watering. Phormiums are also very hardy being tolerant of drought, strong winds and a certain amount of frost depending on the variety. They can cope in most environments including windy, exposed seaside locations. Phormiums should be planted in moist well drained soil in sun or partial shade . Phormiums thicken at the basewith age and may need pruning come spring to keep growth in check.